I have loads of unfinished objects (we call them UFOs) lying about waiting for me to pick them up and turn them into something. 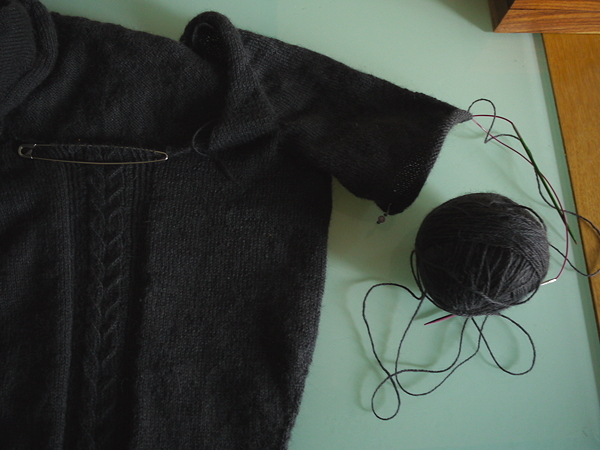 Catkin jumper – on the second sleeve! Right now I am working on a Kate Davies pattern, in Titus yarn. My Catkin jumper has taken me a long time to knit – simply because there is a LOT of stocking stitch, and I’ve kept putting it down to knit other things. However I’m now on the second sleeve, and can see the finishing line, once the neckline is done. That bit will be quite interesting to knit as the cable runs right up to the cast off edge, and that prospect is keeping me going as I slog on with second sleeve syndrome. Like second sock syndrome, but more sleevey. I am loving the lovely charcoal colour of Titus (it’s called ‘coal’) I am knitting my Catkin with, and the yarn is very nice to knit, warm, snuggly, drapey with a slight sheen to it. I hope I haven’t worn the hat out by the time the jumper is finished! 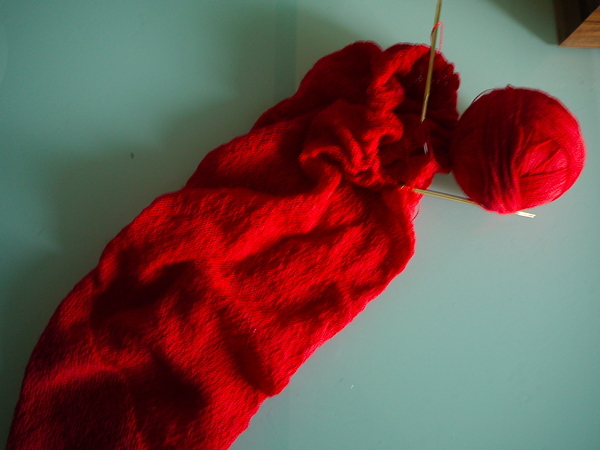 Viajante in delicious tomato red. Between sleeves I have been knitting a Viajante by Martina Behm, in Grignasco Merinosilk laceweight, and the most gorgeous tomato red colour (shade 336). As the yarn is very fine, and the bulk of the pattern is in stocking stitch in the round, it’s a perfect Tuesday night Miss Spiritual Tramps Knitting Circle project at The Bridge Hotel.